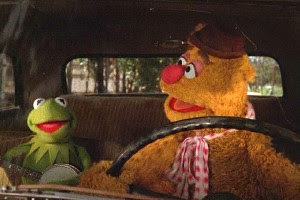 Kermit and Fozzie sang about it in The Muppet Movie, and Tonymation is living it. It's been quite some time since I paid a visit to my lonely blog. There is a reason... because nobody reads it. Actually, it's because I have been busy doing freelance work for Reel FX, Janimation, and getting a full time job with Midway Studios back in Austin, Texas. That's right, I am traversing the same roads that brought me to L.A. to get back to Texas. This time a little further south than our once home in Big D.
Mrs Tonymation and I were initially going to buy a house, but found that property taxes in the Austin area border on extortion, so we decided to rent. After searching the high and low, at apartments, we did a search for rental houses. They were a tricky bunch to track down. I think they are a bit on the shy side, and like to fly under the radar... kind of like how you wouldn't admit you were a freshman in high school. But, eventually we were able to find a great 4 Bedroom home. So, that means all of you are welcome to come visit any time you like. Disclaimer: Visits are limited to weekdays between Saturday and Sunday. All travel dates must be approved by the Pope, Jesus, and Elvis, and must have proper signatures from Walt Disney on the required WD-40 form. Standard fees apply. Side Effects may include: loss of wallet, nausea, gas siphoning, sudden urges to scream, missing organs, and loss of memory. We are still waiting on our stuff from California to arrive. Until it does, our furniture consists of a love seat, and a couple of air mattresses. There's nothing like camping in your home. Soon our precious valueables will arrive in thousands of unrecognizable pieces. Ah… moving is so grand.